Neobanks serve an untapped slice of the small business market with a mobile-first approach focused on digital banking and payments. San Francisco, CA, June 11, 2018: There has long existed a large segment of the roughly 30 million U.S. small businesses that sit in the gap between traditional consumer and small business banking offerings. Now, a handful of fintech “neobanks” have arisen to fill that gap with superior digital banking services aimed at freelancers, sole proprietors, and small firms. These businesses are less interested in a large branch network and are frustrated with current digital consumer and small business offerings. 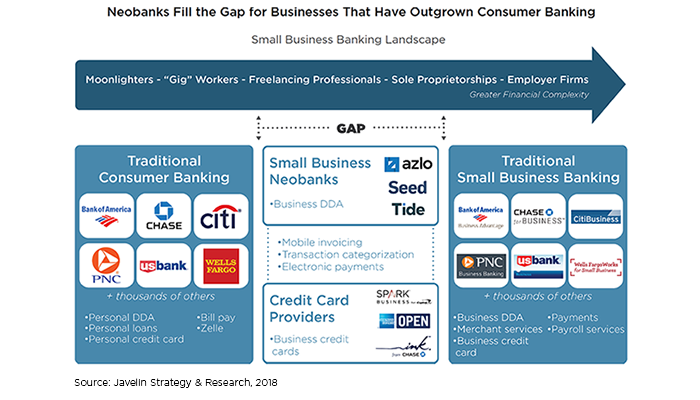 The new report, Small Business Neobanks: Filling the Digital Gap for Entrepreneurs and Freelancers, examines the market need for neobanks and explores why financial institutions should take a note. Designed for tech-savvy customers dissatisfied with traditional bank offerings, neobanks offer mobile-first, branchless transacting and servicing. Neobanks are particularly intriguing in small business banking because they reveal a desire among the business population for better integration of digital tools such as expense tracking and electronic invoicing, streamlined account opening, proactive use of messaging through push notifications, in-app access to customer service, and intuitive mobile design. The report, Small Business Neobanks: Filling the Digital Gap for Entrepreneurs and Freelancers, is based on information collected in a random-sample panel of 1,000 small and micro businesses in an April 2018 online survey, and on Javelin secondary research and interviews with key neobank executives.